A page from the March-due ANGEL SPECIAL: LORNE ("The Music of the Spheres"), by John Byrne, with colors by Eisner-nominee Ronda Pattison. 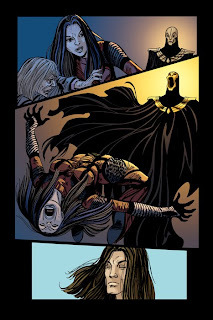 Pictured are Groosalugg, who plays a big part in this issue, Illyria, and a third chap who doesn't seem to have their best intentions in mind. Hmm,why was the previous page pulled.The one with Cordy the dragon and Groo? Groo mistakenly had in his brown contact lenses, we're fixing that.